northIsraeli soldiers invaded, on Wednesday at dawn, Tubas city in northeastern West Bank, and attacked local protesters by randomly firing gas bombs in several directions, causing a fire in one home. The head of Tubas Department of Civil Defense, Hilal Hammad, stated that the soldiers fired many gas bombs at protesters and many surrounding homes. He added that one of the bombs smashed the window of a room, rented by Hamada Abu Nasiriya, in a home owned by Mohammad Rayeq Daraghma, and caused fire in the furniture. Firefighters rushed to the scene and extinguished the fire before it spread to the rest of the property. The soldiers also abducted seven Palestinians in the areas the al-Jalazoun refugee camp, and Doura al-Qare’ village, north of the central West Bank city of Ramallah. 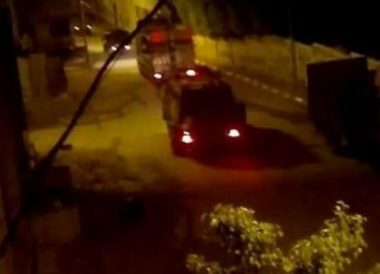 Also at dawn, the soldiers invaded Deir Abu Mashal village, northwest of Rqamallah, and abducted eleven Palestinians, after storming their homes and ransacking them, in addition to two Palestinians in Jenin refugee camp, in northern West Bank. In addition, dozens of soldiers invaded the Deheishe refugee camp, south of Bethlehem in the occupied West Bank, shot five Palestinians, including a medic, and abducted three others.